Galvanised wire rope is packed with the potential to impress and in the case of this 16mm 6×19 galvanised wire rope it certainly lives up to this expectation of excellence. Flexible, strong and completely customisable, it should tick all the important boxes. Wire rope which has been galvanised is a boon for those who want to use it outdoors or in any area where moisture is an issue. Corrosion which could be caused by rain and salt water getting onto the surface will be prevented. This gives the 16mm 6×19 rope more prospective uses than many other alternatives. On a technical level, it offers a 15,702kg WLL, allowing it to be used for load bearing tasks in which this capacity will suit. The 16mm diameter is complimented by the fibre core, which ensures added flexibility when compared with steel core counterparts. Whether you decide to adapt the 16mm 6×19 galvanised rope yourself, or allow Rope Services Direct to work with it to create a custom assembly, there are lots of variations available. Our full loaded line up of fittings means that there is no creation to complicated for us to develop for you. Getting in touch with RSD is never a chore, whether you decide to give us a ring on 01384 78004 or ask for a quote via email. Friendly, fast replies from our experienced team are guaranteed however you decide to contact us. 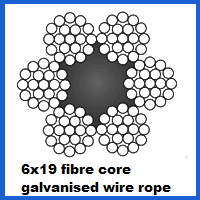 16mm 6x19 Galvanised Wire Rope Overall rating: 5 out of 5 based on 6 reviews.